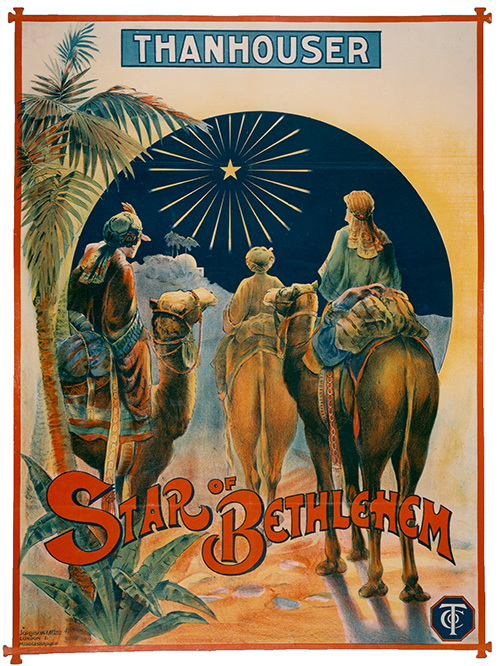 The Star of Bethlehem Poster Images (One and Three-Sheet) Courtesy Thanhouser Company Film Preservation, Inc.
Notes: 1. This is believed to have been the last Thanhouser film distributed by the Film Supply Company of America. There was a break in the ranks, and the companies affiliated with Mutual, including Thanhouser, left Film Supply. 2. The December 25, 1912 issue of The New York Dramatic Mirror lists this film under the Mutual heading in its review section and under the Film Supply Company heading in its calendar section. Similarly confusing listings occurred in other trade publications. In early 1913, certain 1912 films that were earlier distributed by the Film Supply Company were listed as Mutual films; perhaps they were transferred to Mutual. 3. Additional publicity was given to the film for the next year or so, and it was shown widely during the 1913 Christmas season. 4. The negatives for this film are believed to have been destroyed in the Thanhouser studio fire of January 13, 1913. Paper prints of some scenes are preserved today in the Library of Congress. 5. The Photoplay Magazine, December 1912, featured a scene from this film as its cover illustration, and included an expanded story by Willard Howe, based on the film scenario. 6. An article in The Moving Picture World, March 8, 1913, titled "The Picture in the Pulpit," listed various biblical categories and cross-indexed them to current films available. Under "Life of Christ" was the following synopsis concerning The Star of Bethlehem: "Somewhat spectacular in places and follows the Jewish or Rabbinic rather than the Christian interpretation of the events leading up to the birth of Christ." 7. Film amounting to some 7,000 feet was exposed during the production of this feature. 8. Thanhouser advertised that this film would be priced the same as a regular release: 12 cents a foot. "The company spent $8,000 to produce the picture and had a cast of 200 people of whom 40 were principals. Seven reels of film were exposed from which the final three were selected. There were special costumes, properties and scenery. One month was consumed in actual production of the picture, exclusive of the preliminary work of writing the scenario, planning the stage action and scenic effects and selecting the cast. The trick effects alone took over a week to produce. Some of the largest scenes were taken by three cameras posted at different angles." "C. J. Hite, president of the Thanhouser Film Corporation, put over a good 'scoop' at the recent Iowa State Exhibitors' Association convention when he showed all three reels of The Star of Bethlehem complete, a film that is not officially released until the end of December." 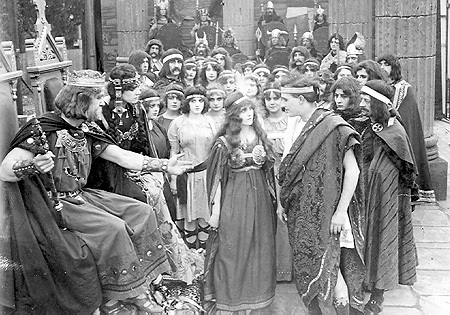 "New York City: October 9, 1912 - The most stupendous production ever undertaken by the Thanhouser Company during its long existence in producing both regular release and feature films is now underway at the studio in New Rochelle. 200 extra players are taking part in the production, and it is stated that a special coach was attached to the morning trains from New York regularly for several mornings past, in order to transport the vast company to the studio. The name of the production is to be Star of Bethlehem. It has such momentous proportions and entails so much extra work that the release date has not been set as yet. Besides the extra cast an enormous amount of scenery and property was required for the film, all of which the Thanhouser Company declares, makes the picture one of the most expensive ones it has ever produced." "WANT THEIR FILM IN CHURCH USE: Thanhouser Film Corporation desires the 'Moving Picture Educator' [the name of a column in MPW - Ed.] to announce that while the renting business is quite out of their province as manufacturers, and indeed they have hitherto declined to touch that branch in any way through plain lack of time, they will be pleased to handle rental correspondence in re The Star of Bethlehem. Churches, lyceums, societies and private persons generally who are interested in this biblical film are invited to write direct to Mr. Bert Adler, Thanhouser Film Corporation, New Rochelle, New York. Mr. Adler will make a special endeavor to connect parties desiring to exhibit the film with those who have it to rent. He states that there is a copy of the picture convenient to about every town of size in the country, and that it was used in many churches during the recent Christmas holidays with marked success. In some, it replaced the customary cantata. He is very anxious to see it in church use in the coming Easter season, and hence the offer to help intending exhibitors secure the film with little trouble." "Last Christmas many American churches put on Star of Bethlehem exhibitions with good success. Encouraged at that time by the good reports received, C.J. Hite boomed it again for Easter church exhibition. Numerous clergymen who learned of the church use of the biblical film at Christmas time became interested, and fresh requests came in for bookings on the picture. The renewal of interest has resulted in many additional letters to Mr. Hite from churchmen in praise of Star of Bethlehem. A New York lecturer on biblical films, Mr. Valentine Hart, wrote the Thanhouser head that he alone showed the picture in churches at Fort Hamilton, Great Neck, Bath Beach and Pleasantville, New York, and at Sunday religious concerts at the following theatres, and audiences of the following size: Bayridge Theatre, Bayridge, New York, 1,600; Montauk Theatre, Brooklyn, New York, 3,000; City Theatre, West Hoboken, New Jersey, 3,500; Lyceum Theatre, Stamford, Connecticut, 4,000; Orchard Theatre, Brooklyn, New York, 1,000; Hippodrome Theatre, Asbury Park, New Jersey, 2,100; Bijou Theatre, Stapleton, New York, 2,000." "A biblical tale, magnificent in its settings, notable in its cast yet wonderfully familiar in its story, is The Star of Bethlehem, as it is told in two [sic] well-acted reels by the Thanhouser Film Corporation. The subject has been impressively handled and is to be released as a Thanhouser Christmas feature, December 24 being the date named for its presentation to the motion picture public. The costuming of the many characters who go to make the story the stupendous production it is, was the consideration of months. The settings were minutely studied and worked out until correct and perfect in every detail, insofar as history enlightens one on the subject. The expense of the whole monster venture was spared not in the least. The story goes back to the time of Micah, the prophet who was the first to inspire Israel with the hope of a great Redeemer. As the Bible gives his prediction, it is supposed to date back to 701 B.C., when Sennacherib waged war against Judah. Micah foretells Zion's capitulation and the deliverance of the people elsewhere. Also he named Bethlehem wherein the Deliverer and the King should be born, as that city was also the birthplace of David. Previous to the birth of Christ, there were numerous signs and portents which affected the Israelites and their rulers, and a vague unrest pervaded the people. Herod was so much affected that he called together the wise men of his court to tell him where and when the Messiah would be born. "Long had the Jewish people paid tribute to Rome, and Augustus, who then reigned, was accustomed to call together, periodically, the subjects of his domain that they might be inscribed. When the proclamation was declared, Mary and Joseph, whose birthplace was Nazareth, journeyed to Bethlehem, the city of David, a place in which his family descent required that he be inscribed according to custom. The film shows the journey as the Bible describes it. When the tired travelers reached their destination they find there is no place for them to rest, as the inns have been filled with the earlier arrivals. Because of Joseph's descent from David, however, the door-keeper offers them the only quarters he has, those in the stable. But Joseph and Mary are thankful for these accommodations and gratefully accept them, as others of their countrymen are forced to sleep in the hills and in the vineyards of the town. "Part two opens with the journey of the three wise men from the East, who hearing of the birth of Christ, come to Bethlehem to adore Him. Resident in three widely separated countries, they have found favor with the Almighty, and are brought through deserts to a common meeting place. The guide of each is a wonderful star in the heavens that precedes each man, until, bringing the three together, it disappears. They exchange experiences, traveling in company to Jerusalem, and there inquire as to the new King of the Jews. Herod learns of their inquiries and sends for them. They are questioned as to who the new King might be and ask to return to Herod and tell him of His whereabouts that he, too, might worship Him. So the three wise men resume their quest. When they had entered Jerusalem the star had disappeared, but now it shines again and guides them to Bethlehem, becoming stationary over the inn wherein there had been no room for Mary and Joseph. At the inn the wise men inquire if any children have been born, and they are told of the child who was born in the stable where He and Mary and Joseph still remained. "Meanwhile, some humble shepherds, who have been tending their flocks on the hillside, are visited by an angel who tells them of the birth of the wonderful child in a lowly stable in the little city of Bethlehem. And leaving their flocks, the shepherds descend the hillside and make their way to the stable. There they find the newborn babe in a manger, with Mary and Joseph attending Him. Kneeling down, the shepherds adore Him. The three wise men enter and offer their gifts from the far East. They bow in adoration before the tiny form in the crib; the humble stable becomes transformed by numerous glittering angels who appear and sing 'Hosanna Unto the Most High.' And the humble shepherds and the learned men from the East kneel side by side in thankful prayer for the privilege of seeing the Savior and for the miracle they have beheld. Thus ends the pretty Christmas story." REVIEW by W. Stephen Bush, The Moving Picture World, December 21, 1912: This review is reprinted in the narrative section of the present work. "That the picture fulfills the purpose for which it is produced is certain. It is not a dramatic product in any sense of the word; it is a simple, vivid story of the coming of Christ. Harmony and taste have exercised in its production, and many of the photographic effects are especially fine. Three reels have been used in telling the story. It is said that 200 people were required, a month was consumed in its preparation, and $8,000 expended before the picture was ready to be shown. Whether the costumes and the characters are historically correct we do not know. Certainly they have been kept close to the biblical narrative and tradition. The story opens with a prologue, seven hundred or so years before Christ's birth, when Isaiah beheld in prophetic vision the great things that were to happen in later days, and comforted his down-trodden people with the information. From here the action shifts to the time when Mary and Joseph are being betrothed. The continuity is well retained in developing the various events in the theme." No release due to the three-reel release the preceding Tuesday.